FCI has one of the most extensive selection of swivel glides in North America. your speci?c needs & requirements. nylon to poly to metal in sliding PTFE, non-slip TPV or non-maring felt. 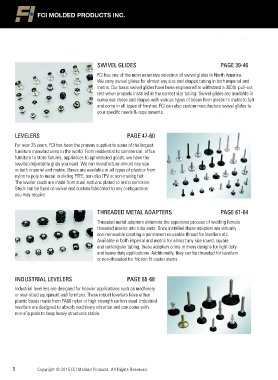 The leveler studs are made from steel and zinc plated to resist corrosion. non-removable creating a permanent re-usable thread for levellers etc. or non-threaded for friction ?t caster stems. non-slip pads to keep heavy structures stable. 5 Copyright ? 2015 FCI Molded Products. All Rights Reserved.